If you haven't been past 222 M Street in a few months, you may not have noticed that St. Matthew's Evangelical Lutheran Church has been demolished. The old church building was razed back in May so a new church, community center, and apartments can be built. In the interim, St. Matthew's is sharing space with the congregation at St. Augustine's Episcopal Church on 6th & M Street. 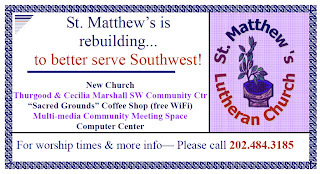 I recently contacted Pastor Huber of St. Matthew's to get an update on the progress at redeveloping their site. St. Matthew's is teaming up with Trammell Crow and CSG Urban Partners on redeveloping 222 M Street. Internationally recognized architecture firm BBG-BBGM will design the project - another local Southwest project the architects have recently designed is the Mandarin Oriental Hotel. The redevelopment will include three components (1) a new St. Matthew's Church, (2) the Thurgood and Cecilia Marshall Southwest Community Center, and (3) an apartment building. The pastor hopes the new church will include a Fellowship Hall for community meeting space, as well as a sanctuary that could accommodate theatre and performances, in a partnership with Arena Stage. The community center hopes to include the following: a coffee shop called "Sacred Grounds", a day care center, a computer lab, thrift shop, multi-media classroom, community outreach center, and a Southwest Youth and Children's Choir. The apartment project, as planned, will include approximately 195 units - 15% of which they hope will be workforce housing. The development team still needs to get zoning approval and submit a PUD before construction can begin. Pastor Huber says they hope to have their submission to the Zoning Commission done soon. I'll be tracking further progress of this project and once renderings are available, I'll be sure to post them. Special thanks to Pastor Huber for his assistance with reporting on this redevelopment project.